Orange County Sheriff Carl DuBois, Rev. 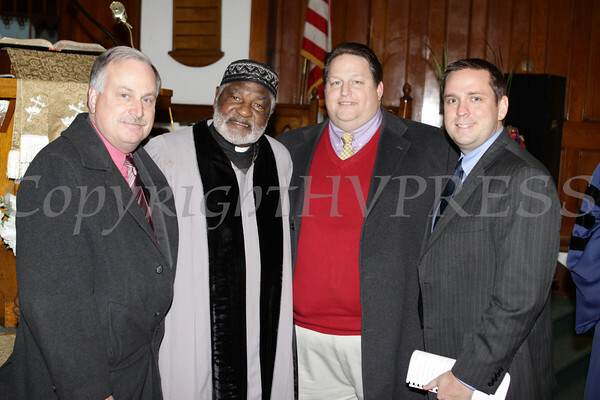 Dr. Coleman Briggs, Dutchess County Legislator John Forman and Town of Chester Supervisor Steven Neuhaus pose for a picture following the Christian Ministerial Fellowship of Newburgh & Vicinity sponsored 43rd Annual Martin Luther King Jr. celebration on Sunday, January 15, 2012 at Baptist Temple Church in Newburgh, NY. Hudson Valley Press/CHUCK STEWART, JR.